On this page you will find the posts of all the restaurants we have visited in Mauritius. Non sponsored reviews of hotel restaurants, outside restaurants and local eateries. Amari by Vineet at the Lux Belle Mare is the Indian restaurant on the East Coast. It’s refined, the food is excellent, the paired cocktails a true discovery and the service excellent. Guaranteed a good evening out! Indigo at Belle Mare Plage is a great spot for a lovely and fancy lunch on the beach. The views are stunning, light salads, grilled fish or sushi – they have it all on the menu. The atmosphere is relaxed, so is the service. Relaxing Sunday family lunch? this is the place! We recently visited the tea museum and factory of Bois Chéri. Somewhere on the mountain you have their restaurant Le Bois Chéri. The restaurant offers beautiful views of the south coast. They serve Mauritian food – and specialities made with tea from the estate. Their cafe offer tea tasting and serve pancakes, waffles etc. to go with the tea. In this post of about the Rum Factory of Chamarel, I also write about their very good restaurant l’Alchimiste. It is definitely worth considering stopping there for lunch should you be in the area. You also get a free tour of the Distillery. If you are looking for great pizza in the north of Mauritius, you must try La Voglia Matta (or Chez Marco) in Trou-aux-Biches. We loved the dough, the toppings and the restaurant! An awesome pizzeria not far from the beach. Probably the best Mauritian food on the East Coast of Mauritius! Chez Tino Restaurant has it all the little terrace with lovely views, good food and great Mojitos. A great Italian restaurant 1974, Da Antonio e Giulia located in the North of the island, in the little coastal village Trou-aux-Biches. Italian owners with good food, in a great little spot! A must go if you are in the North of the Island. We do like Dim Sum in the family. We eat out quite a lot and Chinese always tops high. Grand Ocean in Port Louis is currently one of the best Dim Sum restaurants in Mauritius. A good Greek is always a good idea I think! At Zorbas The Greek in Grand Baie you get authentic food. The views are fab over the bay, for lunch and dinner. I had lunch there and love it! The chef, Zorba?, is Greek. Boulettes are one of the Mauritian street foods you must try if you enjoy eating on the go! You might wonder what boulettes actually are? and where to try them if you are staying in the Grand Baie area – read about my quick lunch at Ti Kouloir. 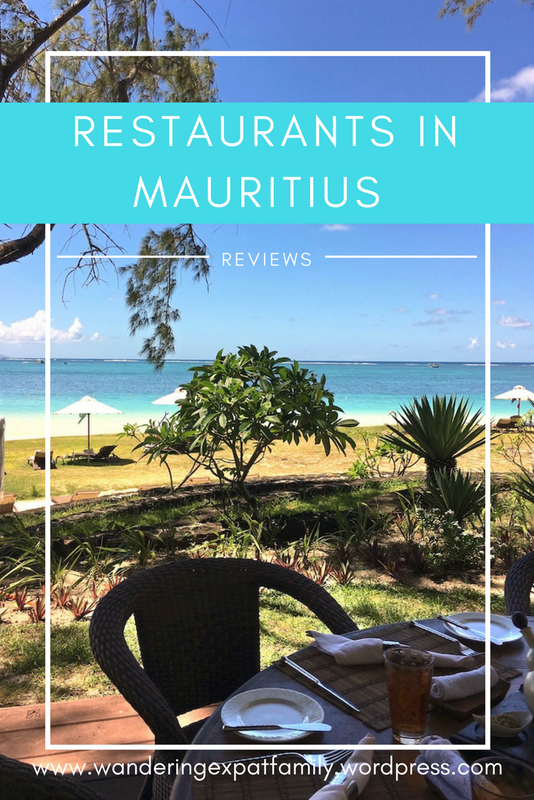 Mauritius looks like a great place for eating for sure! Amari looks especially yummy, especially your picture of dessert. I’d also want to try the Chinese place and the Greek food. I always like to eat when I take a trip! food is an institution in Mauritius! I don’t think I have ever met so many people who like to eat so much and talk about food as well 🙂 Mauritius is a place to visit if you like food! This sounds delicious! Dumplings of all sorts are my three-year-old’s favorite food, so these would be perfect for us.